Apple Tree provides much more than daycare for your family. Our preschool program helps parents build a strong foundation for your child's future success. Apple Tree provides childcare that engages children in an advanced curriculum where students quickly exceed expectations. Children enjoy learning in a safe, fun environment with passionate teachers. Come see the advantage our preschool can give to your child! Apple Tree students are happier, healthier, and smarter. No limits to learning! Click here to read more about what makes our school so special. Small class sizes and excellent teachers allow us to meet the needs of each individual child in our program. Learn more here! Want to know what’s happening at The Apple Tree School? Our School Calendar tells you about holidays and special programs throughout the year. We have many exciting programs! We encourage you to become an active part of “Our” school. Click here to start elevating your child's education today! The Apple Tree School has over 40 years of experience in teaching early childhood education. We provide a superior education in a safe, home-like atmosphere where children of all ages thrive. The Apple Tree School is unique. 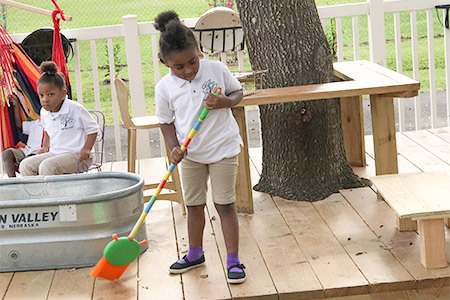 We are an independent, private elementary school that proudly provides the best early childhood education in the Houston Area. Beyond that, we strive in every area to make sure that we have created an environment for your little one to truly thrive. Every child needs safety and school is no exception. We understand that we work with the most precious part of your life. All of our teachers and staff are vetted and background checked then put through a thorough interview process—with checked references—to make sure that our teachers are not just trustworthy, but the best in Houston. Through our fantastic teachers, we offer rigorous academics to challenge your student and help them thrive, while leaving them the creative space they need to truly develop as individuals. We have the most passionate educators invested in your child’s development, education, and growth. A child needs to interact with the world around them to truly learn. Mistakes must happen for them to develop natural boundaries and learn how to pick themselves up and endure. Letting our children learn, teach each other, and truly hands-on is key to their development. Our goal is to break the mold of children separated from learning by screens and books. Many of our activities are educational play, and we make sure that your child is learning and expressing themselves with their hands on activities to build strong, resilient, and creative individuals ready to confidently thrive in the world we will pass on to them. Studies have shown the tremendous benefits of a good diet for a child’s well-being and health at every level. Evidence suggests that a healthy organic diet reduces the rates of eczema and wheezing in children, a key component in avoiding asthma. It also decreases the chances for depression and concentration problems in children (and adults) including dramatically lowered ADD (Attention Deficit Disorder) rates, and improved behavior across the board. Even in prisons where select studies have implemented organic and healthy diets, researchers have seen significantly lower incidents of violence and aggression. All this to say, that we really believe that every child should have access to a diet this healthy. But since we can’t change the world with a wish, we are starting with our Apple Tree School. We not only feed organic lunches to our students, we grow a portion of the food ourselves with the help of your children. 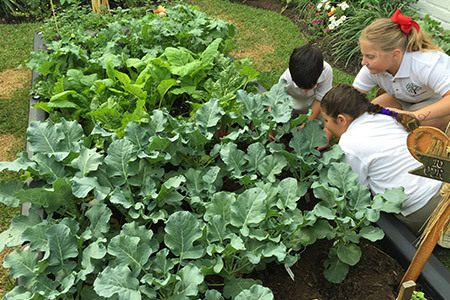 One of the highlights of our work is most certainly the pride our children show when they first make the connection of their work in the garden to the food in front of them, as they realize what they created and what a little work can bring you. With a strong academic environment, room to express themselves, and the best food you can grow, it’s no surprise that our students have some of the top test scores in the state. We know that the world isn’t based on test taking, but it’s a good metric to see how our education and school is adding up to others around Houston. We are incredibly proud of our students’ hard work, dedication, and spirit. Seeing them shine in life is our greatest reward. We make sure that our class sizes are made for individual attention. Children are not meant to be lost in a sea of other students. They are meant to get the individual attention that any child needs to thrive. We make sure that every child gets individualized attention for their own needs. We know that blanket education without focused attention is no way to get your child to thrive. Each child is an individual with different strengths and weaknesses. To fully bring out their best, they need to feel that individualized focus and love. The world isn’t simply about being the best you can be, it’s about being a healthy individual that adds to their community. Here at The Apple Tree School, we don’t just teach information, we teach a way of being. Our children learn important virtues such as honesty, diligence, fairness, and loyalty. Students read and discuss the Greek fables of Aesop to discuss the morality of the stories and build critical thinking and an admiration for the virtues that will take them far in life. We are proud to offer the finest early education available in Houston. Nothing makes us prouder than watching our students thrive in life. We offer excellent academics, organic food, individualized attention, moral grounding, and space for students to play and become themselves. If you are looking for a private elementary school with healthy lunches and the best academics, look no further. Browse our site or contact us today for more information, questions, or to tour the school.